The governments of France, Italy, the United States, the United Kingdom and the United Arab Emirates have expressed deep concern over fighting in Libya and urged all parties to immediately de-escalate tensions, which are hindering prospects for UN political mediation. n a joint statement issued Thursday, the five countries said at this sensitive moment in Libya’s transition, military posturing and threats of unilateral action only risk propelling Libya back toward chaos. 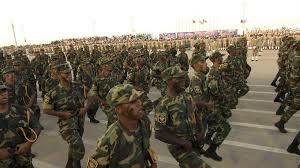 “We strongly believe that there is no military solution to the Libya conflict. Our governments oppose any military action in Libya and will hold accountable any Libyan faction that precipitates further civil conflict”, added the statement. UN Chief Antonio Guterres also called Thursday for calm and restraint following reports of clashes between Tripoli-based Presidential Council (PC) allied forces and the self-proclaimed Libyan National Army (LNA) of warlord Khalifa Haftar. Residents in the town of Gharyan, outskirt of Tripoli, reported a small scale clash between Haftar forces and the PC-aligned forces. The confrontation came following orders by Haftar to his troops to take over Tripoli through peace or by force, reports say. In an audio recording posted on facebook Thursday, the Eastern Libya strongman asked his forces positioned around the Libyan capital to enter the city for its control but they should spare civilians, state institutions and personal properties. Guterres on two-day visit to the oil-rich African country, on Twitter expressed his concerns as the UN is about to host in the Libyan capital a national dialogue conference this April 14-16. “I am deeply concerned by the military movement taking place in Libya and the risk of confrontation,” the UN Chief said. “There is no military solution. Only intra-Libyan dialogue can solve Libyan problems. I call for calm and restraint,” He added. In their joint statement, the five countries voiced their backing to UN Special Representative of the Secretary-General (SRSG) Ghassan Salame as the UN seeks to break Libya’s political deadlock, improve transitional governance, and chart a path toward credible and peaceful elections. They called on all Libyan actors to work constructively with SRSG Salame as the UN finalizes plans for the national conference planned for April 14–16. The UN Security Council will hold this Friday a closed-door emergency meeting on the situation in Libya after Commander of the Libyan National Army Khalifa Haftar ordered his troops to launch an offensive on Tripoli, vowing to liberate it from all illegal armed groups. Posted by Hafid El Fassy on April 5, 2019. Filed under News, Zoom. You can follow any responses to this entry through the RSS 2.0. Both comments and pings are currently closed.